A name that I came to respect a lot around the time of their last album, 2008's Oblivion Beckons, sadly West Virginia's Byzantine were to split soon after the release and despite trying haven't managed to get back together properly until earlier this year, releasing their fourth album partly financed through Kickstarter. I'm in two minds about bands funding their releases this way; it's always a shame that labels don't recognise their talent, but it's better than not having the albums at all. And given the difficulties that the members faced, including living a long distance from each other and having jobs and families to consume their time, recording and releasing a new album at all is quite an achievement! That's before we start to consider the album itself, which rips, somewhere between Testament and Lamb of God with a pinch of Meshuggah, and probably the heaviest, fastest, and just plain best record that the band have produced so far. Opener Which Light Shall Never Penetrate opens with a classic melodic thrash intro before speeding up, moving from thrash to groove. It opens up as it continues, turning proggier as clean vocals are introduced and throwing in solo after solo – as well as plenty of the modern chug which caused detractors to dismissively lump them in with the metalcore crowd last time around. 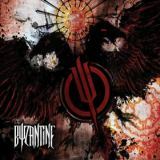 The complexity of the songs and clear maturity of the songwriting suggests that Byzantine deserve a category of their own here, however, not least for their ability to construct compelling and riff-filled songs that have plenty of ear-friendly hooks come the chorus. Soul Eraser is a perfect example, building up convincingly with scraping thrash riffs and throaty bellows, little touches of catchiness with cleanly sung sections – it's like Gojira getting in a scrap with Lamb of God and, to my ears at least, sounds far more human and even catchy than the latter's last few albums. A great example of this is the proggy acoustic interlude in Efficacy, which provides the perfect dark-to-light counterpoint to the previously crushing riffs. Forged in the Heart of a Dying Star ups the intensity, powerful and heavy at first, moving towards proggy and melodic in the second half with some lovely djent-y layered grooving that I'm not normally a great fan of but which simply works here. The inventive thrashing of Caldera is impressive, the sheer amount of riffs thrown in excellent, and nicely followed by Signal Path, which keeps the riffs but reduces the viciousness, using the clean vocals to construct a melodic yet still passionate and very heavy metal tune. Taking an epic turn with Everything I Touch Bursts into Flame which has some of the best soloing on the album, and finishing with the stripped-back Posthumous and the ripping Pathogen, the album comes to a close on a high note. Too modern for thrash, too complex for groove, Byzantine's problem may well be that it continues to fail to fit into an appropriate and easily-summatable niche. I think Byzantine may be forever destined to be a cult band, one foot in the mainstream and one in the underground, but their quality is undeniable and Byzantine will hopefully find them many more fans.